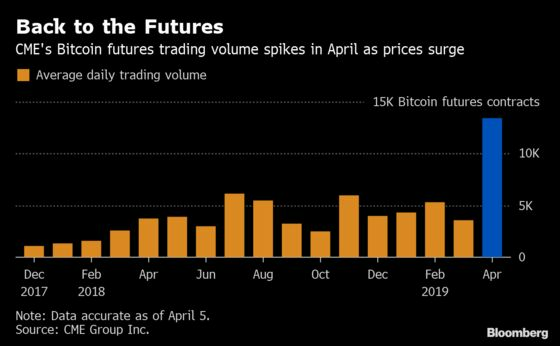 (Bloomberg) -- The sudden resurgence in Bitcoin prices this month is also providing a boost for the futures market, with CME Group Inc. contract trading volumes for the largest cryptocurrency hitting a record high. Cboe and CME first debuted Bitcoin futures in December 2017, at the peak of the crypto frenzy that saw Bitcoin prices top out at close to $20,000. Bitcoin subsequently plunged 74 percent in 2018 as the industry struggled to attract mainstream institutional investment.